Bennett University MBA Admissions 2018 will be conducted on the basis of the scores of the following qualifying exams: CAT/MAT/XAT/GRE/ GMAT. Admission notification and dates are yet to be announced by the Bennett University, the application process has started from 16 October 2017. Candidates who are looking forward to Bennett MBA Admission 2018 will have to apply online for the admissions by following the official link given on this page. Bennett University MBA program is designed in collaboration with Johnson Cornell. 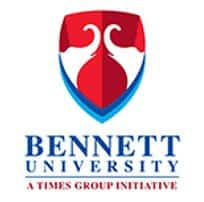 Bennett University is a private Institution which is a Times Group Initiative Institution of Business Management and Technical Studies related courses such as MBA, BBA, B.Tech & M.Tech. Bennett University is located at Greater Noida (Uttar Pradesh) to provide high-quality professional education to the students. Applicants have to take the any of the listed below examination for the admissions to Bennett University MBA Admissions 2018, Scores of the listed below Qualifying Exams will be required for the shortlisting of the applicants. The validity of qualifying exam should be up to July 2018 and beyond. The candidate must have passed their graduation of minimum three years which must be a Bachelor’s Degree or its equivalent in any discipline from Govt. approved University with minimum 50% aggregate marks or equivalent CGPA. The undergraduate candidates who will complete their graduation in 2018 and are in the final year of their graduation can also apply but they must have to prove their eligibility by 30 October 2018. They must ensure that their last paper of final year’s graduation exam finishes before 15 July 2018. The Bennett University MBA Application 2018 has started start from 16 October 2017, and the last date of the submission of the application form is not yet declared by the university. Applicants can apply for admissions to 2018-20 session in both online & offline modes. The Online link to the Bennett University MBA Admission is given below. The applicants have to pay the application fee of Rs 1100 which will be the application form fee of the Bennett University MBA Admissions. The selection result of the candidate will be based on the candidate’s performance in Personal Interview and CAT/GMAT/XAT/GRE score as adjudged by the University Admission Committee. Only the shortlisted candidates will be called for the Personal Interview after which the Final Merit List will be prepared for the selected candidates. STAGE 2: Candidate who is short-listed on the basis of relative merit amongst received applications will be called for a Personal Interview. The final merit list will be prepared on the basis of candidate’s performance in PI and CAT/NMAT/GMAT/XAT/GRE score. Decision made by the University will be final in all such matters relating to MBA admissions. The Bennett University is huge & important part of Times Group. The key brands belonging to the group includes Times Now, Times of India, ET Now, Economic Times, Radio Mirchi, BoxTV, Gaana.com, Magic Bricks, Brand Capital, SpringBoard, Times Internet and Times Jobs etc. Bennett University claims to provide guaranteed job placement to all the graduates of the founding batch program within any of the times group companies if they chose to. The university organises job fairs for graduating students commonly, so they can use the opportunity to meet employers and get an overview of what it’s like to work for a company or a sector that seem interesting to them. As it is a new university so as of now there are no placement records for it. It was Established under Uttar Pradesh Act Number 24 of 2016. Gazette notified by the Government of Uttar Pradesh Vide No 1402(2)/LXXIX-V-1-16-1(Ka)- 25-2016 Dated 16 September 2016. For continuation of scholarship in 2nd year, the student must achieve a CGPA of 3 and above on a scale of 4 in the first year of studies, do not incur a fail grade in any course and do not have any disciplinary action initiated in the first year.